Purnati can offer assistance for cultural research and studies in Indonesia. We offer assistance in organizing cultural research and studies in Bali, for both groups and individuals. Please contact our office with any questions. Purnati is the home of the James Murdoch (1930-2010) Personal Library. James lived a rich and varied life as an arts administrator, artistic director, manager, promoter of Australian music and musicians, consultant, writer and broadcaster. James was a student of the cultures of Bali and Indonesia and lived in Bali since 1990. On 28th and 29th July, 2012, the extraordinary setting of the Bali Purnati Centre for the Arts hosted the performance and audio recording of pieces by the American composer John Cage. 2012 is the year celebrating the composer's 100th birth anniversary, as well as the 20th anniversary of his death. The project that was realized at Purnati connected Cage with the gamelan of Bali. It was conceived and produced by Giovanni Sciarrino, aka John Noise Manis. 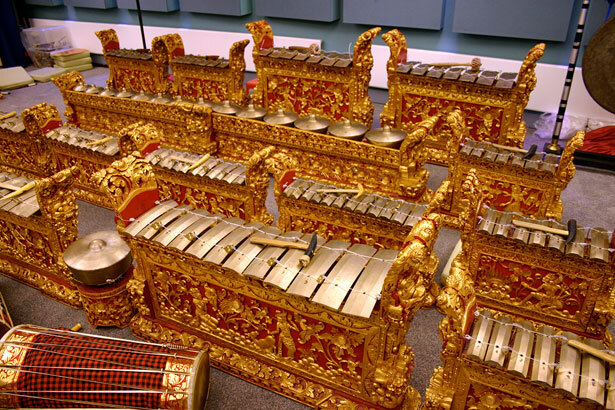 Artistic curator was Dr. Andrew McGraw of the University of Richmond, Virginia, who painstakingly translated the original scores into gamelan language, skillfully instructed the musicians, and conducted the rehearsals. Performers were I Made Subandi and a group of eight of his most talented young musicians. The music chosen for the project belongs to the early years of Cage's multifarious artistic life – the years 1945-'50 – when the composer used his own invention, the 'prepared piano', for expressing his particular needs of that period. The idea of performing that music on gamelan instruments came from the simple observation that sounds and rhythms of those particular compositions and of the Balinese gamelan are very much kindred. Although John Cage – and also the 'minimalist' American composers Terry Riley and Steve Reich – never openly recognized to have drawn inspiration from the Indonesian gamelan, a stylistic parenthood manifests itself in varying degrees and in different compositions to the attentive multicultured listener. And the relationship is particularly evident in the case of Cage's pieces for 'prepared piano'. Thus, the idea of 'Returning Cage to Gamelan Bali'. The recordings will likely be published on CD. Legong Dance is a highly stylized and extremely difficult dance traditionally performed by young girls. It is choreographed to the finest detail with no improvisation allowed. Fire Dance is an exorcism against the spirit of possession. Young performers dance barefoot in trance on top of glowing coals. Kecak Dance is a ritual dance created in the early 1930's for the movie "Islands of the Demons" by a German painter and intellectual Walter Spies. He for the first time combined the chanting chorus of the "sanghyang" trance dance with a story from the "Ramayana". It is highly charged, emotional and very impressive, all male circular chorus of over 100 performers. 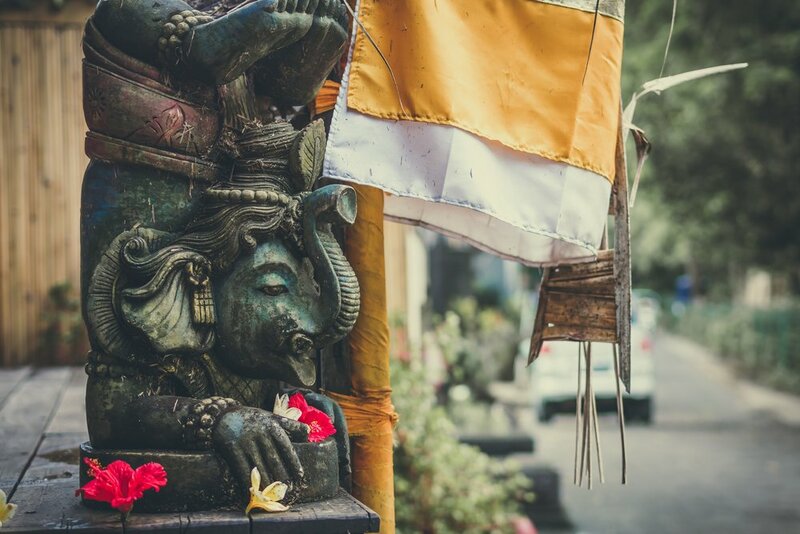 derives from the indigenous ancient orchestra of Java, but what is played in Bali today is altogether more lively and progressive than anything you’ll hear on the larger island. The Balinese gamelan is characterized by its brilliance of sound, its sudden changes of volume and pace, and its virtuoso displays of precise, fast playing. Ikat is a cloth for which both warp and weft have been dyed with designs before forming a pattern, is produced and sold in the Bali Aga Village of Tenganan. Endek is a local handmade cloth, where a pattern has been dyed into the weft by tying it with strips of plastic. Songket is a favorite textile amongst Balinese for festive religious occasions is a brocade called songket which are woven threads of a gold or silver color. It is widely available and is especially beautiful when new and fresh. Pottery Ceramics have never played an important role in Balinese culture, expect for the utilitarian pot, bowls, lids, roof tiles and bricks, that are made out of a poor quality red clay. Painting There are different styles of painting in Bali. The best known are associated with the towns of Batuan, Ubud, Sanur and Klungkung.. The most traditional imagary depicts daily scenes as well as legendary ones. The Kamasan or Klungkung style is famous for restrained or monochrome palette. They are comparatively realistic, fill every corner of the canvas with detail, and lack any real attempt at light and shading effects. Wood carving There are some wonderful craftsmen in Bali who, fashion wood with delicate steel tools and a lightweight hammer, working with extraordinary speed. They also produce painted carvings made from local softwoods. Hardwood carvings are produced using imported wood. Stone carving Balinese stone carvings, unlike wood carvings, have been subject to limited western stylistic influence. Figures from nature, as opposed to mythology, have long been incorporated into stone carving design.. The stone used for carving is a soft local sandstone. Gold and Silver Ubud is the island’s silverware center. Intricate, items from rings to tableware are the local specialty.